EXCLUSIVE STREAM OF THE WEEK My Jerusalem's instrumental version of "Sweet Chariot"
02.11.14 TUESDAY TUNE DAY - IAN MCLAGAN - "I'M HOT, YOU'RE COOL"
Tuesday Tune Day - we feature one song from our catalog each week. Please listen and let us know what you think. 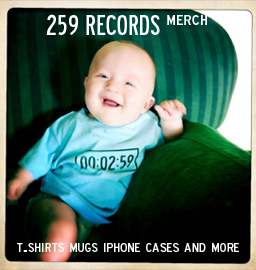 All releases are available at 259records dot com. All killer... no filler. 02.04.14 TUESDAY TUNE DAY - MATT MAYS - "LOST SOULS"
"Lost Souls" by Matt Mays - It's no secret that this is my favorite song on Matt Mays + El Torpedo. This song helped me get through my time in intensive care... and Matt still dedicates this song to me whenever I am lucky enough to catch him in concert. One of my favorite memories is when Matt and the boys opened for Mike Ness of Social Distortion - who is in my top 5 favorite musicians of all time. Mike Ness is a fan of the album, and requested MMET to open for him in SoCal. I asked Matt to please play this song during his set... and while they were playing it, I looked over I saw Mr. Ness standing stage right nodding his head along to the music... and INTO it. Yeah... I cried. So what?